Q2 meetings were held in May for all three groups. While this month is a busy time for our members, we had great turnouts for our meetings and continued to learn about worthwhile causes in our community. Our chapter has donated over $161,000 and we look forward to adding to that total. We’re on track to donate $100,000 a year! Last quarter, our members donated $22,000 collectively to the selected charities. We love hearing from the recipients regarding the impact our dollars made on their organizations. 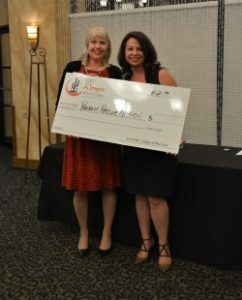 JDRF – Desert Southwest Chapter was the Q1 recipient of our Ahwatukee donations. Paula Boca-Bommarito, Executive Director, brought along a special guest to address the group. Savannah was diagnosed with T1D as a teen and learned to save her own life every day. T1D is a journey and a 24/7 one. Savannah felt misunderstood and judged by her peers at school. She participated in the JDRF camp after being diagnosed. Camp helped her relate to kids just like her. 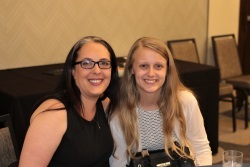 She made new friends and came away feeling more comfortable with her T1D diagnosis. Our donations helped make camp possible this year for several local children diagnosed with T1D. View her touching story here. 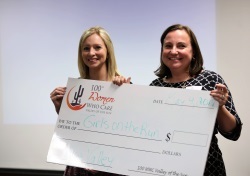 Nikki Kontz, Clinical Director of Teen Lifeline, brought peer counselor, Madeline, to describe the impact our Scottsdale donations made on their organization. Every 5 days we lose a child to suicide in Arizona. It’s the 2nd leading cause of death in children. Teen Lifeline offers a hotline and texting service to teens along with education in schools that teaches students how to connect to each other, the signs to look for in their peers and how to help each other when a friend may be struggling. Madeline was struggling when she first moved to Arizona a few years ago. She didn’t know anyone, was home schooled, and a family member committed suicide. The sadness she felt inspired her to do something and help others. She became a peer counselor at Teen Lifeline and found a second family. She made new friends, learned new skills and now helps others in similar situations. 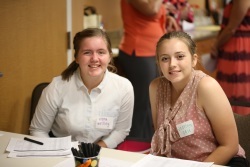 “The best choice I ever made was to volunteer at Teen Lifeline,” shared Madeline. Listen to her story here. Spina Bifida Association of Arizona – Sharri Runnels, Executive Director, was excited to announce to our West Valley members that their donations were used to purchase medical alert bracelets for children within the spina bifida community. The bracelets are very reassuring to parents when their kids are away from them. Our donations were also used for their adult services and supported focus groups and coaching. 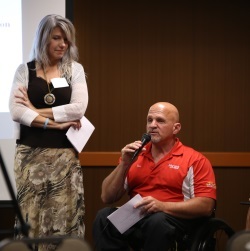 Dave Martin, Chairman of the Board, shared his lifelong journey with spina bifida. Dave’s been in a wheelchair his whole life. He grew up with two brothers and always wanted to do everything his brothers did. Independence was the most important thing to him and he wanted to be self sufficient. He never let anything stop him. Dave joined the spina bifida board of directors to change the perspective parents are being told when their child is born with spina bifida. He wants to show a positive side of the birth defect. “It’s not the end of the world. You just have to be there for your child, push them and raise them into the person you want them to be.” There are so many medical advances now that help children born with spina bifida live a fulfilling life. Learn more here. Girls on the Run – Cindy Brown nominated this charity who inspires girls to be joyful, healthy and confident using a fun, experience-based curriculum which creatively integrates running. 1,400 3rd – 8th grade girls participated in their programs in 2016. Gabriel’s Angels – Kristine Kassel shared how this organization delivers healing pet therapy to at-risk children, nurturing their emotional development and enhancing the quality of their lives forever. Their purpose is to provide opportunities for at-risk children to build core behaviors needed for a brighter future. These behaviors include trust, empathy, respect, and others consistently lacking in this population. Phoenix Rescue Mission – Mary Jordan and Carina Burtell explained how this nonprofit provides Christ-centered, life-transforming solutions to persons facing hunger and homelessness. Over 22,000 men, women, mothers with children and families were served in 2016. 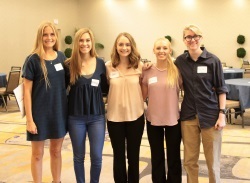 Fresh Start Women’s Foundation – Hayley Weiss is a mentor for this organization and sees firsthand how they empower women to transform their lives through education and engagement. Their programs and services focus on three core values: economic self-sufficiency, education and personal development. The Centers for Habilitation – Tena Morgan describes the tremendous benefit TCH provides to our disabled population. TCH is committed to finding creative and innovative ways to provide hope and purpose for individuals with disabilities. Through TCH’s programs, individuals with significant disabilities are able to participate in community activities, have safe places to live and go to during the day to socialize, earn a paycheck, gain new experiences and increase independence. 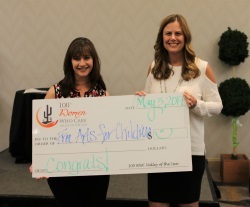 Free Arts for Abused Children of Arizona – Rose Marie Stremel nominated this charity and explains how Free Arts’ mission is to heal abused and homeless children through artistic expression. They are guided by the core values that – Art Heals: the creative arts transform and inspire lives; Every Child Matters: children have the right to be cared for and respected; and Mentoring Works: mentoring builds self-esteem, social skills, trust and the ability to express emotions in a positive way. Goldensun Peace Ministries – Sharri Runnels shares how this charity promotes the physical, social and spiritual well-being of adults with developmental disabilities. They provide a living environment that encourages a better quality of life for their community members, strengthens the family and encourages congregational and community involvement. Lost Our Home Pet Foundation – Thyra Gadek’s love for animals is apparent in her charity nomination. Started in 2008 after the housing crisis, this nonprofit provides compassionate services to pets and people in crisis. Their programs are designed to help families and pets stay together when possible. Girls on the Run – Holly Alexander remembers what it was like to go through the awkward years of growing up. 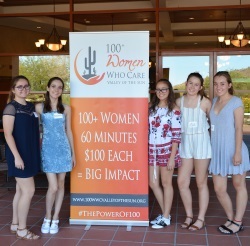 Her charity nomination provides girls with the tools to develop self-confidence and create positive connections with peers and adults. Their 10-week running program is paired with activities designed to empower girls. AND THE SELECTED CHARITIES ARE…..
God’s Garden Treasures provides beautiful flowers for our raffle each quarter. Karin Crawford, Owner, has a unique and creative approach we all love. She made special spring bouquets for us this quarter. Sunnev Chang, Ahwatukee, and Christine Wilson, Scottsdale, were the lucky recipients. We are blessed to have three amazing venue sponsors who generously donate meeting space for our quarterly gatherings – Foothills Golf Club, Hilton Scottsdale Resort and Villas and Courtyard by Marriott. Please consider them for your next corporate event or social outing. 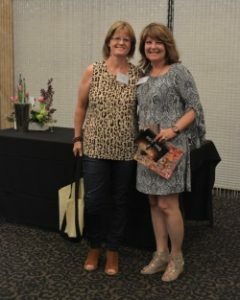 A BIG THANK YOU to our media sponsor, Foothills Living, for featuring our chapter in their April edition. 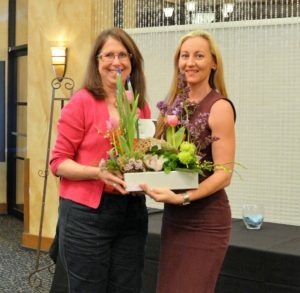 The Ahwatukee Foothills News also published a great article on our chapter in March! We welcomed Dubek Media Group to our sponsor group! DMG offers quality video production and media training. They are helping us produce videos to promote our chapter. Corporate sponsorships provide us with the necessary funds to cover our administrative costs and donate 100% of our donations to the selected nonprofits. We welcomed a new corporate sponsorships this quarter – because…Space for Life. because offers more than 15,000 square feet of breathtaking meeting space, a variety of world-class catering options and an ideally central location for events. because also financially supports local-to-Phoenix charities through every event it hosts. 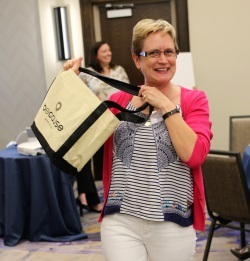 Kathy Sweet, founder of because, gave away four swag bags to our members as special treats. A big THANK YOU goes out to our event photographers as well. Stephanie Fry of Geek Eyed Designs, Colleen Katz of Pictures in Pixels and Beverly Shumway of Arizona Ohana Photography. 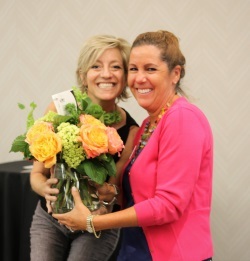 These talented ladies generously donate their time and services to ensure we capture all of the incredible moments at our meetings. Q3 meetings are August 22nd in Ahwatukee, August 23rd in Scottsdale and August 24th in the West Valley. Register here. The charity nomination deadline is August 8th. THANK YOU to our teen volunteers from Desert Vista HS, Pinnacle HS, Horizon HS and Trivium Prep! You rock! Q2 is complete! Have a wonderful summer!